​Tactical Air Support recently purchased 21 F-5E/F supersonic aircraft from the Royal Jordanian Air Force, adding to the company's existing fleet of five Canadian CF-5Ds, like the one Air Force Magazine flew in (above) on Dec. 14 in Reno, Nev. Photo courtesy of Chase Gallagher. 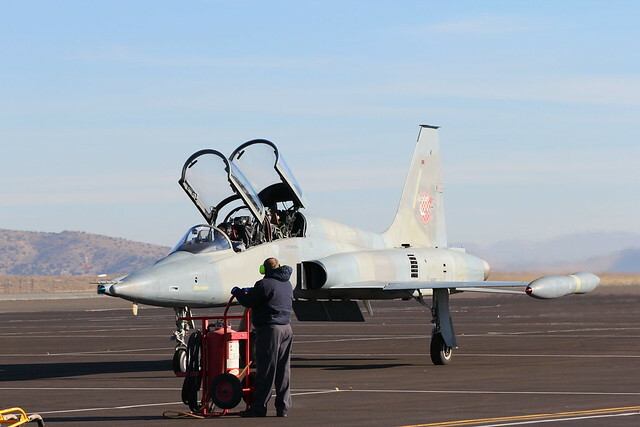 RENO, NEV.—The two-seat CF-5D barreled down the flight line outside of Tactical Air Support’s Reno, Nev., facility for a recent media orientation flight. Still painted in its Canadian aggressor camouflage but with the company’s logo on its tail, the aircraft lifted up over the Sierra Nevada Mountain Range toward Lake Tahoe. 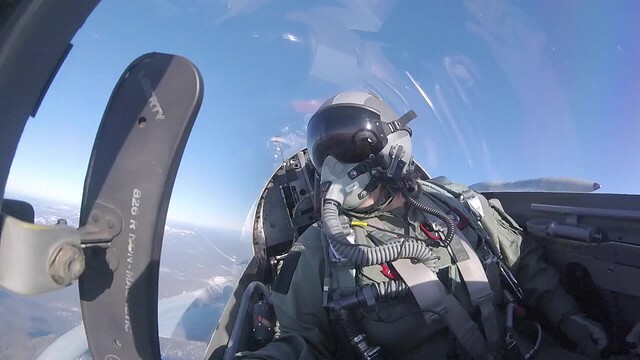 With the “highest roll rate of any fighter in the US inventory,” the F-5 can quickly switch from one maneuver to another during high-level fighting scenarios, said TacAir instructor pilot Zack Mosdale, who also flies F-5s in the Navy Reserve at nearby Naval Air Station Fallon, Nev. Although fourth-generation fighters such as the F-15, F-16, and F/A-18 have better capability, “the margin is small,” said Mosdale, who has flown F-5s since 2002, accumulating 2,500 hours in the aircraft. An experienced aggressor can capitalize on any error a frontline pilot makes, which “really drives the point home,” that the blue-force pilot, making the same moves, should have won the engagement. “It’s like a Ferrari losing to a Corvette. The only reason that happened is because the driver is better,” Mosdale said. The CF-5D that Air Force Magazine flew in is used mostly as a trainer and is modified for specific Canadian requirements. However, TacAir is hoping to break into the emerging commercial aggressor market and recently procured 21 F-5E/F variants from the Royal Jordanian Air Force that will be modified to fit USAF and US Navy requirements. The company currently provides consulting services to the US and international militaries, including maintenance support for the F-5, flying the F-16 oveseas, and supporting joint terminal attack controller training here in the US, said Scott Gallagher, TacAir senior vice president and chief revenue officer. Air Force Magazine News Editor Amy McCullough flies in a Tactical Air Support CF-5D from the company's Reno, Nev., facility. Staff video by Mike Tsukamoto. TacAir hopes to capitalize on the collective experience of its F-5 maintainers and pilots such as Mosdale (the company employs 52 weapons school graduates and 17 former weapons school instructors), its fighter ethos, and the capability of the F-5 itself. The small, nimble fighter is still flown as an aggressor by the Navy and Marine Corps, and serves as a frontline fighter in 19 different international air forces. Designed to be easily maneuverable at high speeds, the aircraft boasts an instantaneous turn rate of 16 degrees per second and a sustained turn rate of nine degrees per second, according to a company fact sheet. As USAF looks to find innovative solutions to its pilot shortage problem, the service plans to hire-out nearly 40,000 hours of Red Air. The idea is to rely on contract pilots and aircraft for the aggressor task, freeing-up blue-suiters who would normally perform the duty for other, higher-priority missions. An official request for proposals from industry is expected to drop in January, with multiple contract awards issued as early as April 2018. Once in place, USAF will be ordering up the largest outsourced aggressor program in the world. It will cover 27,234 sorties per year at 11 bases, including 11,250 hours, or 7,500 sorties per year, at Nellis AFB, Nev., home of the US Air Force Weapons School, according to industry leaders. The Navy also is expected to award a similar contract in January, though on a much smaller scale, and US Air Forces in Europe has issued a request for information to industry to see what capabilities it could provide at Spangdahlem AB, Germany, Aviano AB, Italy, and RAF Lakenheath, England. Other companies are also building up their fleets with plans to bid on the Air Force contract. Draken International is the only commercial company that now provides aggressor air at Nellis. It recently announced the acquisition of 12 South African Atlas-made Cheetah supersonic fighters, bringing its total fleet to 109 jets, including eight Aermacchi MB-339s, 27 MiG-21s, 21 L-159s, 22 F1s, 13 A-4s, five L-39s, and one T-33. In September, Textron Airborne Solutions acquired 63 Mirage F1 aircraft formerly owned by the French Air Force, making it the “world’s largest private supersonic air force,” said Jeffrey Parker, chief executive officer of the Airborne Tactical Advantage Company (ATAC), which was bought by Textron last year in anticipation of a rapidly growing contracted Red Air market. Photos courtesy of Chase Gallagher. In 2016, TacAir received permission from the US State Department to bring the 21 Jordanian fighters to the US. The disassembled aircraft, most of which arrived by ship in May, are being rebuilt at the company’s St. Augustine, Fla., facility. Gerry Gallop, TacAir senior vice president and chief operations officer, said the first aircraft from the new fleet is expected to arrive in Reno “just prior to Christmas” with the first flight shortly after its arrival. TacAir is still evaluating different upgrades for the aircraft, noting the final decisions on modifications will be made after the US Air Force releases its RFP, said Archie Rippeto, vice president of aviation services. “The nice thing with the F-5 is it’s currently being flown in the [US] Navy, [and] it’s being flown by a lot of countries, so there are a lot of companies out there that are targeting the F-5 for upgrades,” said Rippeto. Those upgrades could be “fairly basic” or extensive, depending on the customer’s needs, but “the big one is radar,” he noted. “We worked with folks to come up with plans to meet the requirements and we put together a package that makes it a platform that has very capable avionics, so it’s really not the same aircraft anymore,” said Rippeto. TacAir is working closely with Northrop Grumman, which originally built the F-5 and is located next door to its Florida depot, to put the aircraft back together and complete the necessary modifications. Air Combat Command boss Gen. Mike Holmes said “in a perfect world” the Air Force would “have the resources to maintain the aggressor squadrons it used to have” and “do it in-house with modernized threats.” But, in the world we’re living in now, we’re limited in personnel and end strength. In the late 1970s, right after the Vietnam War, the Air Force had four aggressor squadrons, but dwindling budgets forced the service to shut down the 26th AGRS at Clark AB, Philippines, and the 527th AS at RAF Alconbury, UK, leaving one aggressor squadron at Nellis and, later, one in Alaska.